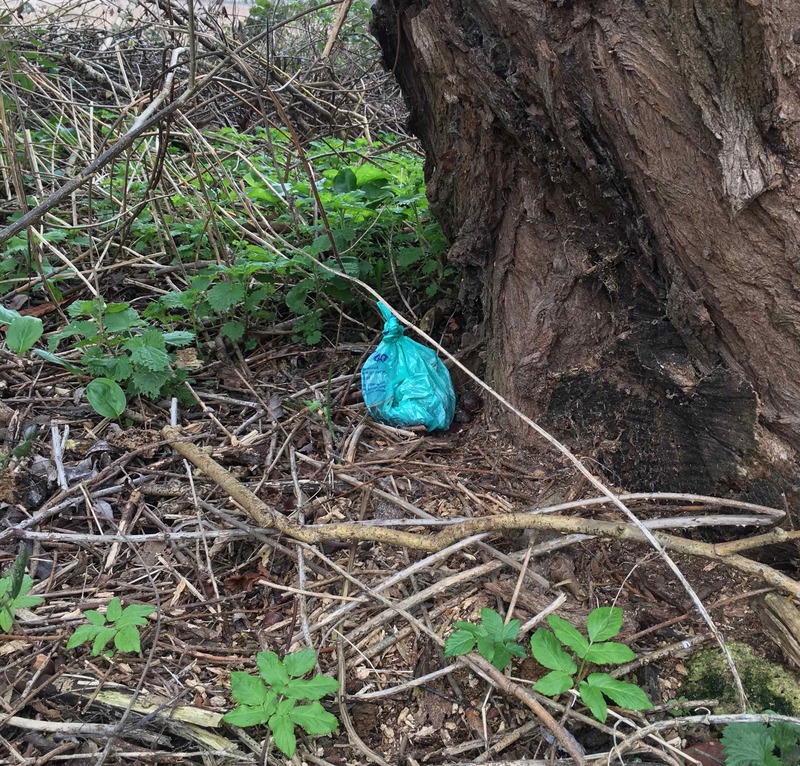 They are to be seen on all the routes where the dogs bring their human helpers (these examples were found by the River Wey at Guildford). 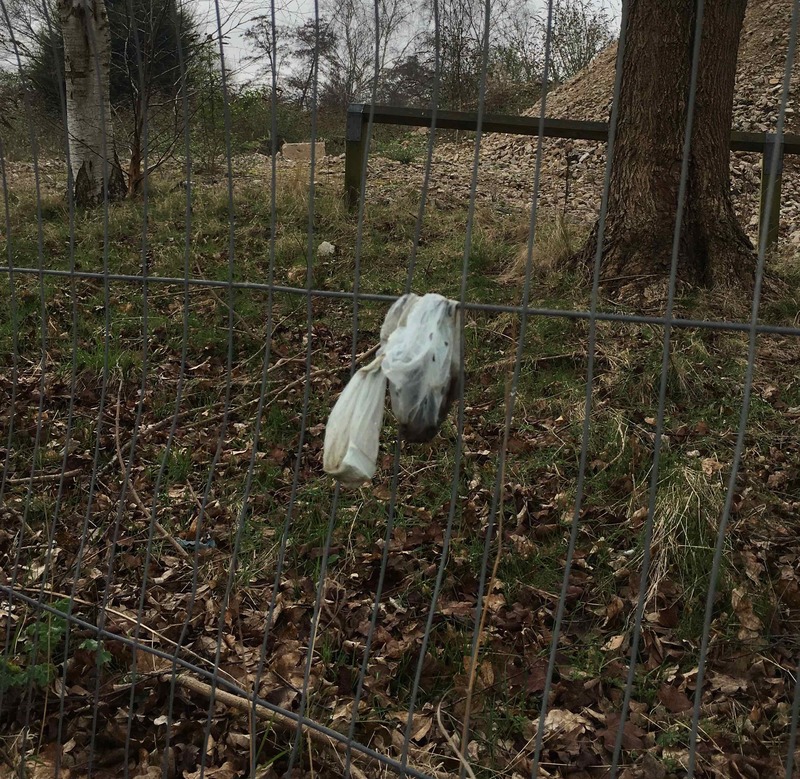 Strange fruits, these turds encased in shiny bags, neatly tied and placed on grass, at the foot of trees, hung from branches and fences. They are offerings to the God of the Dogs, though few outside the cult know what rituals or incantations accompany the deposits. Week on week the tributes vanish and new ones take their place. Where do they go, these sacred gifts? Some say that they are collected by the priests of the Dog-God for secret purposes, others that the Dog-God absorbs them into Himself by occult means. Many think that they are swallowed up by the Earth to participate in the cycle of decay and growth, and that the Dog-God find this sufficient. The secular authorities have introduced collection points for the offerings at certain points along the routes and some of the Dog-God followers, who call themselves Reformists, use these. But the Orthodox disdain these conveniences, holding that the rituals cannot be properly observed using these communal deposits. The Old Believers continue to trust in the ancient way, ridiculed by both the Orthodox and the Reformists: the turd deposited as it is, unwrapped, unadorned. The OBs will nod and smile, and repeat the old tale that the walker who steps on it is blessed, some fortune to come, some turn in luck to be expected.